The jagged peaks and alpine lakes of Banff National Park fill 2,500 square miles of western Alberta. 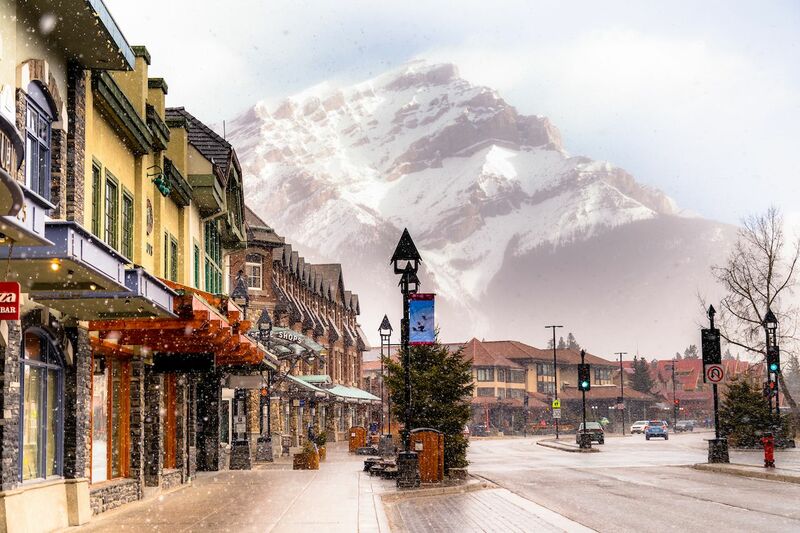 The area, which encompasses the towns of Banff and Lake Louise, along with three ski resorts and some of Canada’s most rugged backcountry terrain, is both surreal and irresistible. You could almost picture Frodo Baggins on his fantastic mission — traversing his way up and across the mountains, narrowly evading capture among the craggy pitches that stretch across the provincial border into British Columbia. You can embark on your own enchanted journey here, stepping away into the solitude of North America’s most pristine wilderness, pack on your back and map in hand, and quickly escape from the grind of city life. The best time to do this is in winter when the road-tripping RVers and international sightseers have gone home, and in spring, before the hordes of tourists arrive and it’s still pretty much winter this far up north (there will still BE plenty of snow on the ground). The peace and solitude, coupled with the adrenaline of adventure, will hook you right away. The area is the birthplace of Canadian mountaineering. Banff National Park, along with neighboring national and provincial parks, is part of a UNESCO World Heritage site — not only because of the area’s natural beauty but because of the living Columbia Icefield that continues to carve through the valley. A winter trip to the area gives you the chance to step into nature in much the same way the first-ever tourists did, working around Lake Louise on a snowshoe tour or donning a pair of crampons to trek up a snow-packed trail to the ice falls at Johnston Canyon. Mountaineering in the Canadian Rockies was born of a necessity to climb, build, and develop the area during the construction of the Canadian Pacific Railway, a passion that quickly infused those passing through on the train. Construction of the railway, which began in 1881, was pivotal to the development of western Canada, and the Bow Valley in particular. Crews of workers from eastern Canada were unaccustomed to the harsh landscape and terrain of the high country, and building a functional railway over the mountains was a serious undertaking that required the import of experienced mountaineers from Europe. 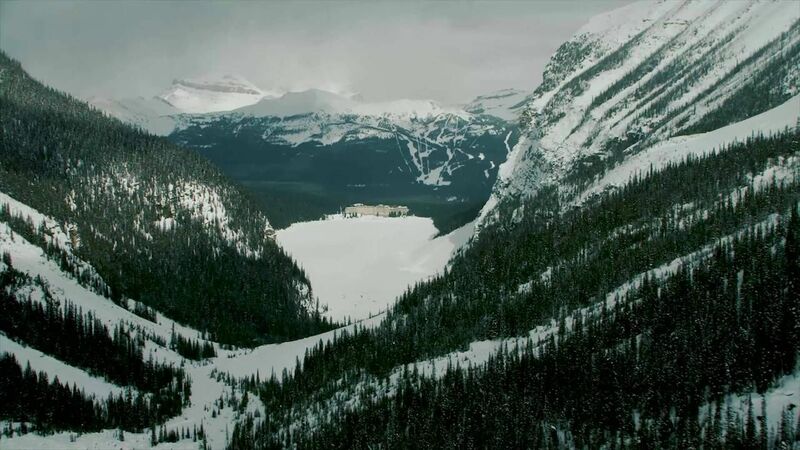 “Us Canadians, we knew about snowshoeing and tapping maple trees, but we didn’t know about climbing mountains,” said Paul Lapierre, a backcountry guide at the Fairmont Chateau Lake Lousie. This changed with the arrival of Swiss mountain guides in the early 20th century. They were brought in by The Chateau to lead guests on guided expeditions into the backcountry. Guests would arrive by train in those days, often for an entire season in the park, the guides serving as their host to the area’s outdoor offerings. Skiing first arrived with axemen working for the railroad during its early days. They used the old wooden planks to navigate the rugged terrain for work and hunting. By the mid-1890s, skiing began to find recreational footing inspired by Scandinavian ski jumping. The first ski run in the valley was actually a ski jump erected on Tunnel Mountain in 1911, just outside the town of Banff. The town of Lake Louise, about 30 minutes north of Banff, is Canada’s highest permanent settlement, with just over 1,000 full-time residents, and nowadays, they can’t get enough of the backcountry. The luxury hotels still embrace their backcountry roots. The Fairmont Chateau Lake Louise is the dominant man-made structure of the northern Bow Valley, towering over the lake itself with Mount St. Piran, Devil’s Thumb, and Fairview Peak rising behind it. Upon first glance, the hotel looks like little more than a magnet for the Aspen crowd. Walk into the lobby and you’re immediately clutched by the arms of luxury. A grand chandelier dominates the pillared entryway, while boutiques slinging Gucci and Hugo Boss give way to large bay windows that reflect the bright tint of the lake just beyond the dining room of the Lakeview Lounge. A closer look reveals a taste of the brand’s roots, a not-so-subtle nod to its guests that are actually here to get outside: the avalanche bulletin posted at the front desk, the enthusiastic chatter of seasoned mountaineers emanating from the Guide’s Cabin as they exchange tales of that morning’ excursion into the wilderness. “The Chateaux was built for guides,” said Lapierre. In fact, it’s a symbol of high status for the guides to be able to call the hotel’s Guide Cabin their office. The hotel’s guides lead visitors on excursions like snowshoe trips around Lake Louise and canoe tours on the lake itself. Much like the pioneers of Canadian mountaineering did a century ago, the hotel’s guides help the enthusiastic traveler access the park’s wilderness terrain. There are also extensively stocked outdoor gear and rental shops, which offer much more than the mass-produced and overused gear you typically find at most onsite rental shops. The hotel as it stands today is a super modern version of what the Canadian Pacific Railway original had in mind. The original structure on the site was a log cabin erected “for (the) outdoor adventurer and alpinist,” says a quote on the hotel’s website. Stop by the Guide Cabin, a wood-lined room lined with topographic maps, in the back of the hotel to experience this first-hand. If Lapierre is around, ask him to take you out for a snowshoe up the side of Fairview Mountain. The hotel’s dedication to its mountaineer roots, however, doesn’t change the fact that it costs a pretty penny — between 499 Canadian dollars (US$375) and CA$699 (US$575) for a standard room — to experience them. But for how hard you’ll strain your muscles out on the mountains, a nice hot soak and a gourmet dinner at the hotel afterward is sure to make you forget the strain on your wallet. Still, there are more affordable options for the backpacker set, such as the Samesun Hostel where you can snag a bed for about $25. Skiing is the best way to experience the Banff backcountry. Once you get out onto the powder, you’ll understand why so many backcountry hounds keep coming back to Banff year after year, despite a wide world of other mountain destinations. There’s just too much to explore, and even longtime locals like Roy Anderson readily admit they’ve barely scratched the surface of what the park has to offer. “The problem with Banff is that once you taste the water, you can’t get away,” he said. Anderson, a longtime conservationist, photographer, and former ski-jumper, has lived in the area since his family immigrated from Norway in the 1950s and has spent his life trekking the area on ski and on foot, usually with a camera in hand. 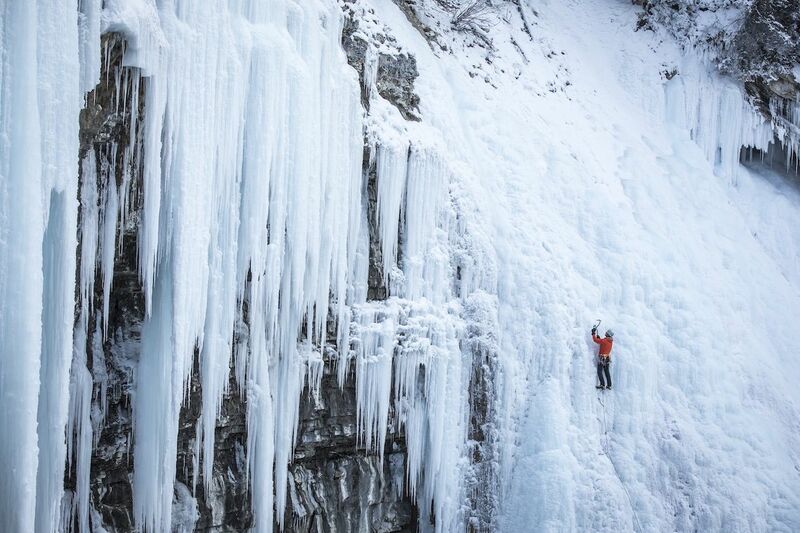 Ice climbing is also popular around the Victoria Glacier behind Lake Louise, as well as in Grotto Falls and the Junkyard, icefields just outside the park. But backcountry skiing is definitely the activity you can’t leave Banff without experiencing. In summer, these trails are well-trodden with day trekkers, but once the snow falls, the only noise you’ll hear is that of your guide calling out the next switchback. “Here, it’s all about enjoying what the national park has to offer, as opposed to places like Whistler where there’s a zip line and all these other ‘adventure’ activities,” said Simon Moffatt, Sales and Marketing Director at Mount Norquay, which is home to the area’s first recreational skiing run built in 1926. 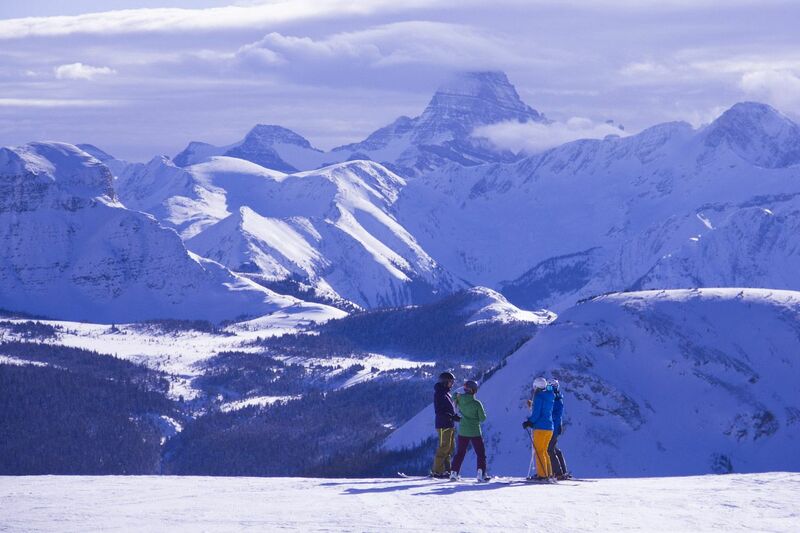 For modern backcountry users, the legacy of the mountaineers lives on most noticeably at Sunshine Village, about 20 minutes outside of Banff proper. Here, experienced out-of-bounds skiers can access an exclusive part of the mountain dubbed the Delirium Zone, a gated-off section of the resort. Pass the beacon check at the top of the Great Divide Express lift and work through a steep hike toward a pair of peaks called The Eagles, and your reward is the “designated freeride zone.” That’s the resort’s term for this ungroomed, off-piste zone that offers dire consequences should one not be familiar with extreme terrain. You must have proper avalanche gear and be familiar with how to use it, and be able to navigate past massive rock bands and long pitches of steep, but typically fresh and deep, powder fields. If you don’t have backcountry gear or a desire to drop into avalanche terrain, you can still look out over the freeride park by hiking five minutes up from the top of the lift to the access point. The backside of Lake Louise Ski Resort is lined with steep, open bowls and hike-to terrain off the top of a POMA T-bar lift that locals have dubbed “The Summit Platter” after it’s round, dish-like seat. This in-bounds terrain off the 8,600-foot summit of Mount Whitehorn is essentially lift-accessed backcountry, though there is a backcountry access gate that drops skiers and boarders down to the peak. Here, you can hike or skin up the peak to access a number of steep, untracked lines. SkiBig3, an organization working to promote the park’s three ski areas — Banff Sunshine, Lake Louise, and Mount Norquay — sells a lift ticket valid at all three mountains. Make it to all three and you’ve completed the Trifecta Challenge, rewarded by a commemorative plaque to take home. Beyond the resorts, the national park offers backcountry users ample access to off-piste skiing and riding, available from multiple trailheads and access points throughout the park. The Association of Canadian Mountain Guides hires out guides to take visitors into the backcountry, an advisable way to go for first-time visitors unfamiliar with the terrain. 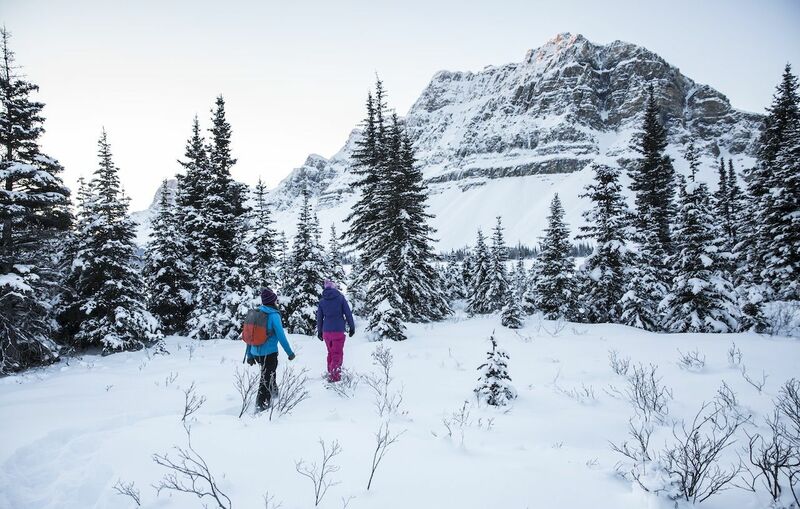 Among the most accessible areas in the park is the trail to Skoki Lodge, a seven-mile skin from Lake Louise Ski Resort, which offers overnight accommodations and access to backcountry lines, some of which run down toward the base of the ski area. It’s easy to be tempted to put off a bucket list trip to Banff to the summer to see the glaciers and peaks in all their glittering glory, go for a hike or a paddle on the vibrant turquoise waters, and not be burdened by the challenges that harsh weather presents. But if you do, know that you’ll be joined by thousands of other summer roadtrippers and international tourists, who pack the two-lane roads and the trailheads rising away from them. Over four million visitors come to Banff per year, up from just over 3.5 million only four years ago, and the vast majority come in summer. Choose to plan your trip around winter, however, and not only will you escape crowds and peak season prices, you’ll be helping preserve the park itself. Park regulators and longtime residents are working to address the ever-increasing numbers, looking to the models of US national parks like Yosemite for guidance. Many in the area believe that part of the solution to keeping the park from becoming overcrowded is to spread the visitors out throughout the year. Another idea floating around is to build a modern train line from Calgary to Banff to reduce car traffic into the park. “That’s how the very first visitors came to Banff, back when it was called Station #8, and that may be how the tourists of the future arrive,” said Moffatt. 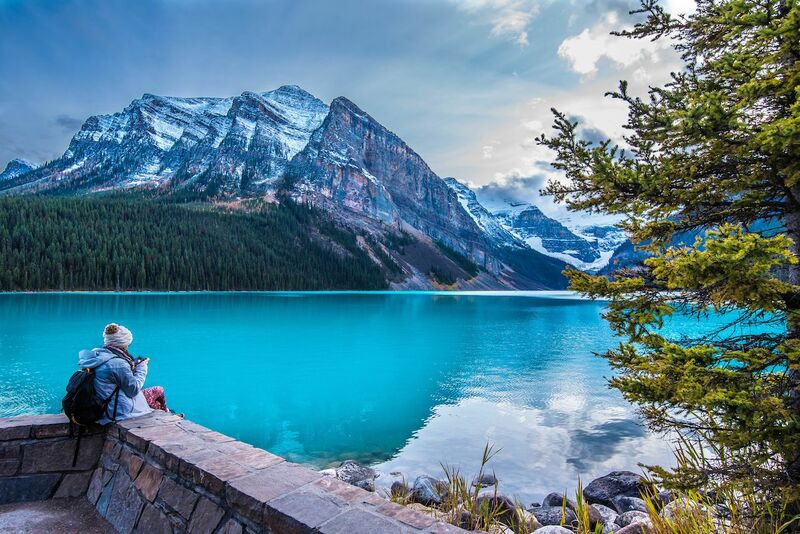 Park regulators are also considering imposing tourist restrictions on some of the most popular sites, including Lake Louise, in an effort to both improve user experience and minimize negative environmental impact. None have been put in place yet. Today, Banff National Park is home to over 10,000 people, most of whom live in the town of Banff. It has proven impossible to curtail certain aspects of commercialization and growth, but the town maintains strict regulations to make sure it remains the place that the cowboys and adventurers who put it on the mountaineering radar want to come to. Park restrictions prohibit anyone who doesn’t work in the park from buying a home within its boundaries. In an effort to address the affordable housing issues that plague mountain towns across North America, both Fairmont hotels in the park offer extensive employee housing complexes, and the town itself is working to offer the same. It’s during winter that these park workers, guides, and town locals will be happy to see you, when they aren’t so beleaguered from busloads of tourists stomping all over their park. Because the winter belongs to the true outdoor enthusiasts, who choose to brave the elements so that they can experience the snowy mountains at their most majestic, the way the first mountaineers did not so long ago.